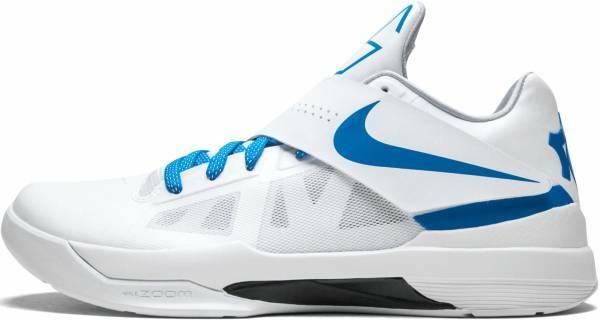 The Adaptive Fit strap of the Nike KD 4 provides great lockdown, mention some buyers. Many buyers praise the Hyperfuse used in the upper. They say it is so breathable. Several reviewers claim that the upper of the shoe does not crease even after multiple uses. The Nike KD 4 needs less time for breaking in, report most sneaker reviewers. The overall construction of the shoe model is lightweight, observe most purchasers. Considering it is one of the older KDs, a huge number of buyers still think that the design of the shoe is aesthetically appealing. The Nike KD 4 runs true to size for narrow footers, just like the eleventh KD signature shoes from Nike. According to users with normal-sized feet, the shoe fits them well because of the standard lace-up system and the movable tongue. A great number of sneakerheads purchase the signature shoe because it is their favorite in the entire Nike KD signature line. The ⅝ collar does not provide a good amount of support, complain most users. The Nike KD 4 runs long and narrow. A large number of buyers complain about how the tight toe box causes their foot to experience pins and needles. Some shoppers are not in favor of the $140 price tag. They say it is too expensive for a KD shoe. The overall traction of the KD 4 works great. However, a few leave comments that the thunderbolt-designed rubber is soft and can easily wear off. Several reviewers point out that the sloped cut at the lateral side of the forefoot hurts their pinky toes. There are even those who experienced blisters. Overall, the Nike KD 4 is still a good performance shoe for basketball. They say that the signature shoe reminds Kevin Durant’s fans of his glory days with the Oklahoma City Thunders. Aside from having it as part of their collection, they can still play in it because Nike KD 4 can still do mean basketball. The KD 4 Retro retails for $140 I believe and I think this is still sitting on Nike's website. So if you guys are interested, definitely pick up a pair. I don't think you'll be disappointed. If you guys are widefooters, be careful with the shoe. Like I said, after hours and hours of playing, it does get very uncomfortable. You're gonna feel that pinching pain on the side of your forefoot and it's really annoying. Other than that, I really didn't think that this was a pretty good performer on court. I do wish the traction was a little bit for consistent on the dustier courts. But it is what it is and that's just how traction patterns are nowadays. Overall, it's a pretty good sneaker. In the KD IV, the designers have continued the consistent performance. The very snug and solid shoe is fit for fast and aggressive players looking for a light weight performer that has excellent traction and responsiveness. It’s a decent shoe and very durable. The Nike KD 4 is designed by Leo Chang and was first released on December 3, 2011 at $95. The midsole features full-length Phylon and a forefoot Zoom unit. The signature shoe’s upper comes in synthetic leather. It has Hyperfuse side panels for a lightweight and breathable wear. The midfoot features an Adaptive Fit Velcro strap that gives not only extra aesthetics but also additional support. The straps have an identical effect to the Jordan CP3.11. Cushion. The Nike KD 4 comes with a Phylon midsole carrier and a forefoot Zoom unit. The cushioning setup delivers impact protection and court feel. Traction. The Nike KD 4 features a thunderbolt storytelling traction. The forefoot has four flex grooves to provide flexibility and enhanced court grip. The heel has flex grooves in a star pattern that helps with floor control. The midfoot has a sizable stiff plate for stability. The outsole rubber is thick enough to endure performances on both indoor and outdoor courts. Mild to dusty courts are not a problem. However, on really dirty surfaces, the shoe slides. The forefoot has the names of his grandmother, aunt, and mother. The “BIG CHUCKY” at the heel is the nickname of Kevin Durant’s first basketball coach Charles Craig. Length and Width. The Nike KD 4 runs long and narrow for wearers with normal feet. As for those with narrow feet, they can opt for their true Nike sizes. Wearers with wider feet must fit the shoe first before making the purchase. Lockdown. To keep the foot in place, the Nike KD 4 comes with a standard lace-up system and an adjustable tongue. Featuring the Adaptive Fit system, the shoe also relies on the midfoot strap to provide a more secure lockdown. This strap is connected to the strobel board beneath the insoles. The durable synthetic leather upper of the Nike KD 4 comes with Hyperfuse side panels for ventilation. The mesh tongue has adequate padding for comfort. The heel counter comes with foam pads to provide support and comfort. When it comes to style, the Nike KD 4 is such a huge hit. Its simple and timeless design fits any generation. Baggy pants are a no-no with this shoe. It is best paired with tapered or slim-cut pants or shorts. Any KD signature release is not complete without an Aunt Pearl colorway. Kevin Durant dedicates the colorway to his beloved aunt who succumbed to cancer. This shoe is a combination of pinkfire and metallic silver. It has a black Swoosh on the lateral side and midfoot strap. A Kay Yow Breast Cancer Awareness ribbon sits on the tongue. Some call it Art of a Champion Battle Tested. Others call it the Thunderstruck / Battle Tested. Whatever this colorway is called, it creates so much buzz in June 2018. The Battle Tested colorway was a witness to Oklahoma City Thunder’s victories over the Dallas Mavericks, Los Angeles Lakers, and San Antonio Spurs. They eventually lost to the Miami Heat during the 2012 NBA Finals. This colorway comes with a white upper with photo blue accents and a gold Larry O’Brien Trophy hang tag. To celebrate Black History Month, this KD 4 is wrapped in black with a midnight fog base. The inner walls, outsole, and midfoot strap features a unique Black History African print. On a game against the Orlando Magic, Kevin Durant wore the shoe on Christmas Day. It was on a limited release on December 26, 2011. The Creamsicle rendition of the fourth KD features the colors of one of the alternate jerseys of the Oklahoma City Thunders. It features a vibrant orange upper with white and blue detailing. In a combination of mint candy, white, and new green, the Easter colorway is part of the pack of shoes that Nike launched on April 6, 2012. In his second All-Star game, Kevin Durant rocked the Galaxy colorway. The metallic silver pair features a NASA-inspired constellation image, an embroidered KD logo at the heel, and a speckled black midsole. As part of the 2012 Summer Olympics, the Nike KD 4 Gold Medal colorway was released as a Gold Medal pack with the Nike LeBron X, Nike Zoom Kobe 7, and Nike Hyperdunk. Who says Nerf is just for kids? KD fascinates Nerf sports and it reflects in this colorway. The KD 4 Nerf comes with a special box that includes a Nerf hoop and ball, and a KD 35 print. The color scheme of the signature shoe features the fun colors of bright crimson, black, cactus, and concord. The Nike KD 4 N7 is a limited release under Nike’s N7 Collection. It comes in two pairs: a white and a black pair. Like other N7 releases, the proceeds went to the Native American communities in North America. The said pairs of shoes also promote physical activities in those communities. While playing for the Oklahoma City Thunders on the road, Durant was seen wearing this black pair that has team orange and photo blue accents. The rogue green colorway worn by Kevin Durant is also unofficially nicknamed as the “Undefeated.” The military green upper has details of black, orange, and wolf grey. The Scoring Title colorway has a Golden State Warriors vibe. It comes in predominantly lemon and tour yellow upper with photo blue hints at the strap, midsole, and rear panel. The tongue features Durant’s point averages for the season: 30.1, 27.7, 28. The Texas colorway is dedicated to Kevin Durant’s University of Texas. It comes with a combination of desert orange and white. Kevin Durant wore the USA colorway during the 2012 Summer Olympic games. The shoe has a predominantly white upper with red and blue accents. The Weatherman colorway is inspired by Kevin Durant’s obsession with meteorology. The lush green pair comes with accents of black, orange, and volt. Released as a quick strike, the Year of the Dragon is inspired by the Chinese Zodiac Sign for 2012. The shoe model comes in a Green Abyss/Bright Mango-Current Blue combination.